After several months of almost uniformly bad press from NYC’s major media outlets, the expansion of the city’s bike network still enjoys sizable majority support among city voters, with 54 percent in favor and 39 percent opposed, according to a Quinnipiac poll released this morning. The city's expansion of bike lanes is less "controversial" than the city's budget policy, according to today's Q poll. The poll is the first solid public opinion data on the city’s bike program since new, physically separated bike lane designs debuted in 2007. Quinnipiac surveyed 1,115 registered city voters, reaching both land lines and cell phones. It’s not the first indication that livable streets projects are popular in NYC, though. A 2009 Q poll found very strong support — 58 percent — for the new pedestrian plazas in Midtown. Today’s poll found roughly constant support for bike lanes among ethnic groups, with slightly more Hispanic voters — 59 percent — expressing support for bike lanes than the overall sample. Voters in the 18-49 age range approve of bike lane expansion at more than a 60 percent clip, with opinion evening off among voters 50 or older. Still, the generational divide is not a case of polar opposition. More voters 65 and older like bike lanes than dislike them — 48 percent to 42 percent. Overall, these numbers should give pause to mayoral candidates who think ripping out the [expletive] bike lanes will win votes. Most New Yorkers don’t look at city streets the same way that placard-holders do. But if you’re looking for reasons to be cautious, you’ll find some in Queens and Staten Island. Opinion on bike lanes in those two boroughs, which have both sided with the winner in each of the last five mayoral elections, was more or less an even split. The 54 percent support for bike network expansion makes it one of Mayor Bloomberg’s most popular policy initiatives at the moment. The Q poll found that majorities currently disapprove of the mayor’s handling of the school system and the budget. Here’s the full breakdown from Quinnipiac. As you can see, the wording of the question played strongly into how people feel about bike lanes, not necessarily their real effect on streets and transportation. A) This is a good thing because it’s greener and healthier for people to ride their bicycle, or B) This is a bad thing because it leaves less room for cars which increases traffic. This is finally the scientific poll that should hopefully put to rest claims that bike lanes are “unpopular” or that New Yorkers are “deeply divided” on the issue. I have been asking Q-Poll to do this for some time now to put this issue to rest and very glad to see they have included it. The comparison to Education and budgeting policy are apt. If this was really a controversial issue, you would see a lot more negative numbers. Now we can proudly say that not only are Bike Lanes the right thing to do from a street safety standpoint, but they enjoy relatively broad public support. This just in: Neighbors for Better Opinion Polls, represented pro bono by a high-powered white-shoe law firm, have filed a lawsuit against Quinnipiac University, claiming that the university knowingly manipulated the data in a poll so as to falsely show public support for bike lanes in New York City. The polling industry faces an existential threat with the non-use of landlines by those who did not always have them, thus skewing the responding population older, though this can be overcome with stratification. I’ll bet the numbers would also be moved in the question was phrased “this is a good thing because people who want to get around by bicycle are less likely to be killed or injured.” “Greener” plays into the “they think they’re better than me” opinions of drivers. Just to follow up, I think 39 percent against is evidence the propaganda campaign has worked. I doubt you’d have had 10 percent against two years ago — or ten years from now if the propaganda campaign does not succeed. 54% versus 39% is about as good as it gets with any issue in NYC. I’m embarrassed though that a majority in my home borough didn’t support bike lanes. Then again, a lot of streets here see so little traffic that such lanes are pretty much not needed. Hopefully that’s the reason for the tepid support. LL – I could imagine this question worded many different ways, but this is important nonetheless as we still win by a substantial and broad majority even on windshield perspective terms. The question was basically, green bikes & less room for cars even if it causes traffic* congestion (which is an assumption, not fact) and a solid majority said YES. But I agree, this is better phrased in advocacy as what it really is – safety improvements for all street users. *”Traffic” to many motorists is basically not being able to exceed the speed limit or having any other cars visible through their front windshield. I agree. I really dislike the whole “cycling is greener” thing because that tends to polarize people. The minute many people hear that phrase they think Al Gore, communist, enviro-wacko, etc. You can make a great case for cycling without even touching the whole zero emissions thing. Bikes move more people while taking up less space. Bikes allow people to integrate physical activity into their daily routine. Bikes are often the fastest way to get around in congested cities (and could potentially beat the subway with a system of completely separated infrastructure). Bike infrastructure is the most cost effective way of moving people in terms of dollars per passenger mile. You see the difference? Hard to argue with any of these facts. Moreover, nothing there touches on topics which polarize some people. Sometimes cycling advocates tend to shoot themselves in the foot. Bloomberg has an approval rating of about 51%. Obama is at about 49%, depending on the source. Sarah Palin has a 38% approval rating. 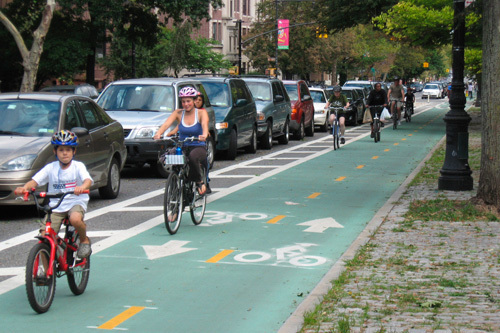 If bike lanes were a political candidate, they’d be the most popular politician in the country. Really interesting to see such a split in opinion between 35-49 and 50-64. My question is whether this is a true generational split or is it a situation where opinions will change as we get older. That is, will my cohort, once we reach 60, start opposing bike lanes, or will we continue to support them? The Quinnipiac poll released earlier this week gave Ray Kelly an approval rating of 67-20. And Ed Koch said he’ll support Kelly if he runs for Mayor. Kelly keeps saying he’s not going to run. My take on this is a lot of the present over 60 crowd that exists now are opposed to bike lanes because they’re physically incapable of riding a bike any distance (Marty Markowitz is a great example). And the reason they can’t ride isn’t their age, but because their bodies atrophied from years of auto dependency. When those who are using the bike lanes now reach 60, chances are good they’ll still be able to bike long distances, and will still support the bike lanes. In fact, they might support them even more. It’s no big deal riding fast and mixing up in traffic if you’re a strong rider in your 20s, 30s, even late 40s like myself. In fact, a lot of regular riders remain relatively strong even into their 70s. I’m not sure though if I’ll be able to, or want to, mix with traffic when I’m 80 or 90. At that age I might be very happy just loafing along at 7 or 10 mph in a protected bike lane, relatively safe from motorized stupidity. Another possibility is by the time people in their 20s get into their 60s, our cities might be devoid of cars on account of energy/economic reasons. If so, then the whole “bike lane” issue is moot. All the streets will pretty much be “bike lanes”. BTW, my mom is 72 and avidly supports bike lanes. And she can’t ride. In fact, she never even learned how when she was younger. In 25 months, I’ll be turning 50, at which point I expect I’ll be joining both the so-called “Neighbors for Better Bike Lanes” and “Seniors for Safety,” and working with leading mayoral contender Anthony Weiner to take jackhammers to the Prospect Park West bike path. My guess is that it is a true generational split. Among the 50 to 64 group, our 44% are the “peace love and understanding” crowd that made a lot of noise back in the day, and their 48% were the “Silent Majority” and are now just the majority. With the population turning over, moreover, the younger you are the more likely you are to have chosen to live in a non-suburban kind of place (or been raised by parents who made that choice) intentionally, rather than just happening to be born here and attempting to shoehorn the auto into a place that has a hard time accomodating it. The massive increase in subway ridership is also generational, I would expect to find. Many of those age 50 to 64 lived here when the subways were extremely unreliable and dangerous, and adopted an auto oriented lifestyle as a lifeboat mechanism (similar to private schools and public schools for the “gifted”) during the bad old days, so they could stick it out. (And even among those against bike lanes, you have to give the credit for sticking it out). Car Free, I don’t think so. There was a comment in one of the rags this week along the lines of: “Bicycles are just not a practical means of transport for those over 40.” I am 38 and 40 year olds are still really old people to me. I am in better shape than I was at 25, I lived here then too, due to riding everywhere on a bike. Also the quote made me think of riding behind a woman in Copenhagen, who reminded me of my 60-something year old mother. This woman impressed me because, one, she (like many others her age) was riding, and two, she was doing it very well, stable, fast, safe etc. By the way, what made this woman stand out to me in first place, she was riding this way with a six foot rug under her arm. Any guesses on why union households have relatively lower support – especially compared to democrats in general? Asking as a lane-lovin’, Queens-livin’ union member myself. Makes sense – I didn’t think of municipal employee union parking placards. My union doesn’t get free parking. Union households tend to be older and more outer-borough dwelling. I don’t trust any poll that supports a Ray Kelly mayoral run. Regarding the generational split, I think it is real. However, I think there is also an issue of self-selection. I believe ther is a life-stage preference that shfits from Urban to Suburban as age increases, so those who remain in the city will be self-selected and not representative of their age-cohort as a whole. Once you condition on people who live in NYC, then I believe the generational split on biking is real. Many of those who are over 50 today formed their lifestyles and habits around the city as it existed in the 70s and 80s. Living in many parts of the city, especially many outer-borough neighborhoods, was difficult without a car. While many made do without a car, they had to deal with a very bad transit system, a lack of local options, poor cab service, and related problems. I think this era informs the attitude of many who consider a “regular, working-class New Yorker” to be a guy from Brooklyn who drives a car. A new poll put support for gay marriage just over 50%. I still doubt this policy is going to be called popular by the punditry for years to come. Popular isn’t what mere voters support; it’s what pundits think the voters support. Responding to #23, I’m 54 years old and came back to Park Slope in 1993. At the time I was 3 weeks away from the lease on a 1992 Honda Accord running out. There was absolutely no question that I would give up the car. Hell, I had been carless most of the time I lived in Washington in the 1980s. Since 1993 my car has been two bicycles and the very occasional rental or Zipcar. And I couldn’t be happier. No car payments, no insurance, no worries about gasoline, no moving a car to the opposite side of the street. And I experience the city better than I ever could in a car. And that’s the point, really. Cars aren’t evil; they have a great purpose but they also have a proper place. I don’t want a hermetic existence. I don’t want to have a suburban lifestyle in the city. It’s a matter of what people want from life, regardless of generation. Yes, the great majority of the “antis” at the October PPW rally were older than me, but that’s not the point. There were plenty of graying beards (like mine) among the supporters, because we want what urban life offers, including safe, traffic-calmed streets in a city that is not subordinated to motor vehicles. And we don’t flinch from change, which is the real story of the “antis.” Their opposition has nothing to do with historical fidelity and certainly nothing to do with “process.” It is all about change and how self-consciously progressive people will scream bloody murder when change laps at their doorstep. Enough said, truly. Time to move on from Prospect Park West. Now that Spring is nigh let’s enjoy the bike lane in great numbers and be kind to the opposition. I think it’s more like their minds atrophied. Interesting issue about the generational split. At the CB6 hearings the “pros” were multigenerational, the “cons” mostly seniors. I just turned 50 myself and this is my first year of full-on daily bike commuting (Bklyn, Manhattan). I even got studded tires this past winter for icy Jan and Feb because I can no longer stand to waste even 15 minutes of my life in a car. The older I get the more activist I become. I am the future. Wait, why hasn’t NBBL claimed that Quinnipiac is cherry picking some data? This just came out today, let’s see what’s in tomorrow’s Post. Yeah, let’s also tune in to CBS to see even if they mention it. Oh wait, lemme get on that. I guess the only demographic not show here is the 100% unapproval of bike lanes by news reporters for CBS and the NY Post. Has NBBL attorney Jim Walden filed a law suit against Quinnipiac yet? They must have falsified this data. That Quinnipiac University poll was worded extremely poorly. It is as if an anti-bike lane person came up with the wording. Even so, the public weighed in in favor of bike lanes. Had the wording been more accurate, I think the ratio in favor versus against would have been much bigger. As others have said, there is no evidence that bike lanes increase congestion or increase the time to travel a certain distance, so saying bike lanes cause traffic is factually incorrect. Secondly, class II bike lanes do not really re-allocate any street space. They do not make is safer for cyclists or take away space from motorists, so I think the poll should have clarified which type of lane they were referring to. There’s an article about this over on Huffington Post even as we post here. They broke it down by party affiliation, with Dems and Repubs complete opposites on pro/con. Be aware that there are some people that will always hate bike lanes–and it isn’t helping that some of the newer bike commuters are emulating a bike messenger ethos that leaves many people antagonistic toward cyclists. mjd: Those ‘studded’ tires are on your bike, right? Studs on cars are illegal in NYC. Only good in rural areas. And that’s a very poor analysis given the nature of politics in NYC. Because the Democrats are the route to power here, you have people who are Democrats in NY who would not be Democrats anywhere else in the country. And because of what NY Democrats tend to do with that power, you have people who are NOT Democrats in New York who WOULD BE Democrats almost anywhere else in the country. Political analysts need to understand the nature of a place where people waited in line for hours to vote for President Obama, but have voted for a Republican Mayor for 20 straight years. @Joe R. (#7), I’d like to add that bicycles don’t kill people, but that’d probably be polarizing, right? Deafening silence on this in our excellent dailies, other than Grimebaum’s blog post. Whaddya mean Shemp? CBS and NY1 reported on the poll….oops…well, I guess they only talked about the Walmart part of the poll…. I guess they don’t want to admit they are wrong….they are just ignoring it. The anti-bike crowd may be small but very vocal and probably backed by someone with deep pockets. Besides, as someone point out already 30-40% of New Yorkers are always opposed to something even if they don’t understand what it means, just because they don’t want to agree with the majority, I guess. Also, by opposing something loudly they’re more likely to get media coverage. Daily News: again – nice write up on WalMart – zippo on bike lane approval. But you can bet the next negative bike story gets big play. Of course it would be. 😉 Didn’t you know that bicycles kill “untold numbers of people”, at least according to some on the other side? Except these numbers never seem to appear when one looks at the statistics. I tend to agree with AdamDZ that the anti-bike contingent is backed by someone with deep pockets. What their motivation is (besides the complaints about double-parking) who knows? To me most of it just seems like irrational hatred of anything different. Or maybe lack of exercise affected their cognitive abilities as Suzanne mentioned in post #27. So the margin of error is 2.8%, smaller than the increase (and fwiw that also means it could be a 7.8% increase instead of 5%); takes care of that. Also, as with any poll, a trend line is more important than the individual poll, so we seem to be gaining 5% a year, which is nice. DK/NA 7 8 5I’ve certainly heard plenty of complaints stating that the lanes are only for hipsters, only forrich white kids and all, but they’re most popular among non-whites (and maybe traditionallyblack and hispanic neighborhoods would be a good place to start building more lanes! ).